Zach and Tab's visit to the East Coast ended with a very nice day on the water, aboard Averisera, with friends John and Erika and their two little girls, Hannah and Phoebe. We started out around 1pm, when Erika arrived at the Marina. Once everyone settled down, we headed out into the harbor. We set the sails, and tootled along in the warm afternoon breeze. Zach and Tab took in the sights, and related memories of their days learning to sail in Boston Harbor back in 2000. We sailed on out to Spectacle Island, arriving in time to satisfy our now growling tummies with a delicious picnic we had brought along. Hannah took this opportunity to sail her new boat, a craft activity by Norm made earlier in the day, and decorated with flair by Zach. We had a wonderful few hours at Spectacle. After lunch, the adults split up, some taking the north trail, others taking the south trail. I stayed on the porch with Phoebe, who took this opportunity to take a nice nap. Hannah convinced Zach to tote her around the island. By 5pm, serious fog was rolling in. It was getting difficult to see Thompson's Island, and the beautiful cityscape was shrouded. It was hard to believe there was a city nearby. As the sun set, and night settled over the city, the fog lifted in places and gave us some interesting views of the harbor. We got back to the Marina and put the boat away, then headed for the Sail Loft, where we all had a hearty meal. What a fun way to spend a day on the water. Thanks Erika and John for sharing your little ones with us! The kids have come east from Lummi Island, WA, for a brief visit to the friends and relatives they left behind when they moved westward 3 years ago. Reason? The Lummi Island ferry goes into dry dock for several weeks, and living on the island becomes more painful with the old pedestrian ferry. So instead of being inconvenienced daily in Washington for 3 weeks, Zach and Tab flew to Boston, to be inconvenienced daily here instead. Yay! Zach and I didn't take any pictures, so this will have to do. 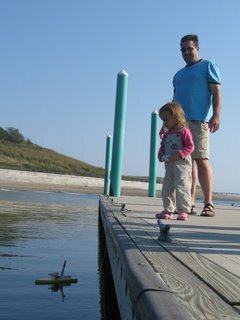 So after lunch, with me playing hooky from work, Zach and I headed down to Constitution Marina to look Averisera over. Zach has worked on a sister boat in Bellingham, Kestrel, the boat we noticed last year which set the stage for our purchase of Averisera. But that's another story. Anyway, with Zach being a boat guy, we soon had all the covers off the berths, the engine, the electrical. Meters, markers, tape, and the logbook to record, became the tools for the next couple of hours. Now we have the beginnings of an electrical layout, a thumbs up on both batteries, same for the engine. Our plan to redo the rigging is also justified. So after we cleaned up the mess we made, we got Averisera ready to sail. Off the dock in a few minutes, and quite a few more to raise the main! Zach needed a rest, having done most of the heavy lifting. 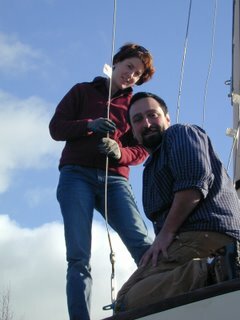 Then, we put up the jib, and sailed on an easterly breeze down the inner harbor. We got close to Spectacle Island, and I gave over the tiller to Zach, to get my jacket on. It was a beautiful afternoon, blue sky, puffy white clouds, steady 10kt breeze. Boston looked pretty good! We took a look at the beach and docks on Spectacle, and rounded the island. Back out in the channel, Zach looked for familiar landmarks. Long Island Light, Deer Island light, Nixes Mate, George's Island, Boston Light. We had a perfect wind, perfect water. We went out past Deer Island, gave the Norwegian Cruise ship (Freestyle Cruising? What is that?) a wide berth, gybed around at the split channel marker, and headed back in. A spectacular sunset warmed up the cityscape in front of us, and evening descended with a warm red glow. With the wind now more southerly, we probably should have put up the spinnaker. But instead we set up an outboard lead for our new jib, and we lazed our way back through the channel. To avoid gybing, we took the main channel, but we saw a J-24 with kite and a J-24 wing-on-wing heading down the small boat channel. Next time, we'll be more energetic and fly the kite. As we passed the airport, sailing took a back seat to hunger, so we dropped the jib, started the engine, and motor-sailed the rest of the way in, in the dying breeze. After a picture-perfect docking procedure, leaving the boat ship-shape, we went to the Sail Loft with hearty appetites. Mussels, calamari, buffalo wings, clam chowder and beer finished the evening off. Thanks Zach!